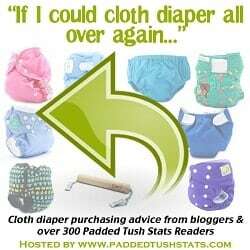 I'm loving the linky that Tara and Carolyn at Padded Tush Stats have set up for this week - it's all about "If I Could Cloth Diaper All Over Again..."
They had extended the idea to us to link-up with them, so Jenna and I will both be sharing our "If I Could Cloth Diaper All Over Again..." posts! When I first decided to cloth diaper, my motivation was primarily financial. Looking at the amount of money I could save by switching from having two in disposable diapers to two in cloth diapers was astounding to me. So in I jumped! I was lucky to have Jenna as a guide and used her wealth of cloth diaper knowledge to guide me into the beginning choppy waters. I can still recall being overwhelmed by all the different options. Not knowing what I liked, or even what the different styles, fabrics, brands and features even meant. Now when I think about cloth diapering, I am head over heals for the cuteness! If I could start all over again, I would base my stash on the cutest, most lovable prints and colors I could find. I mean, who wouldn’t want to pick from a stash of one cute diaper over another equally cute diaper! Lets start with my deepest love… Sustainablebabyish (Sloomb) makes the most amazing fitted diapers. A luxurious bamboo organic fleece combo, and a reputation for quality, these have my heart from the beginning. They recently released the most amazing prints and designs, the Forage, Forage 2 and Sweet Chevvies. I took one look at these and have spent the past week trying to figure out how to fit these into my budget and stash. I literally would LOVE to have every one of these diapers. The one downside is that fitted diapers require a cover; essentially covering the part of the diaper I am obsessed with the most. However, I would use these during the day, so I could probably get a good 3 hours out of them without a cover. Even adding in a layer of fleece under the soaker pad to transition it into more of a hybrid fitted. Tots Bots Easy Fit is a diaper I am completely green to and would love to be able to change that soon. Especially after seeing the “Pooper Hero” and the “Story Prints!” I mean, how cute are these!! I really would be happy with any and all of these prints. Rumparooz brand also have some great prints in both their One-Size Pocket Diapers and Diaper Covers. Lux has to be one of my FAVORITE prints of all time and I would probably make my daughter wear it daily! I have limited experience with Rumparooz, but so far, I love the one diaper I do have from them. They have the most amazing leg gussets and, once again, who could pass up these great, unique prints! I have one Simplex AIO with side snaps in my stash currently and would totally add some more of their great prints! Elephant, Messy Hands, Monsters and Butterflies are so sweet and fun! Not to mention that they are so easy to use and carry natural fiber options. I also love the trim fit of a side-snap! Over the past year, I have fallen in love with Grovia products. Both their AIO and their Shell are amazing. The quality is impeccable and fuelling my cute fetish, they come in some great solid colors and fun prints. Would love to add the Peacock print to my stash! This year they also added Kiwi Pie Fitteds to their product line. The Eillie and Ziggy print are my favorites and would surely be a welcome addition! My staple diaper has become a bumGenius 4.0. Doing my stash over again would certainly still include these! The reliability of this diaper is what I come back to time and time again. A one-size fits all, an easy to use diaper that has held up over the years. I love their fun solid colors; Dazzle, Moonbeam, Mirror, Sassy and Grasshopper, etc. And both their new prints, Maathai & Irwin - and the older Lovelace are to die for! Can’t wait to get my hand on those.